Why Pure! Food & Travel? 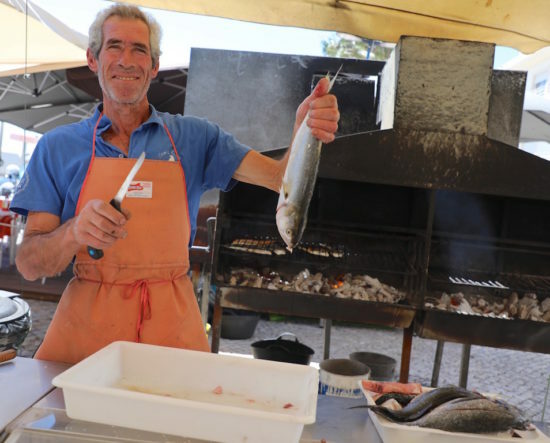 Where do you eat in the Algarve? Pure! 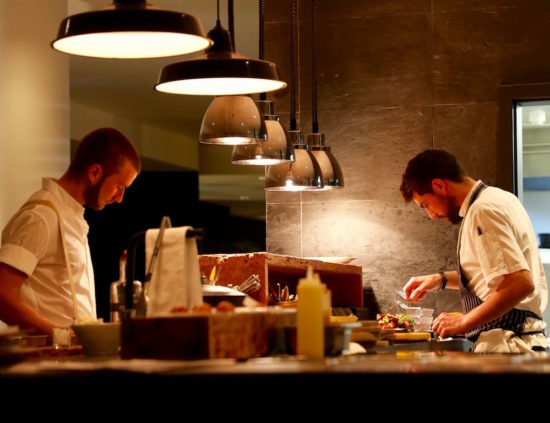 Food & Travel has 4x Algarve restaurants tips for you. 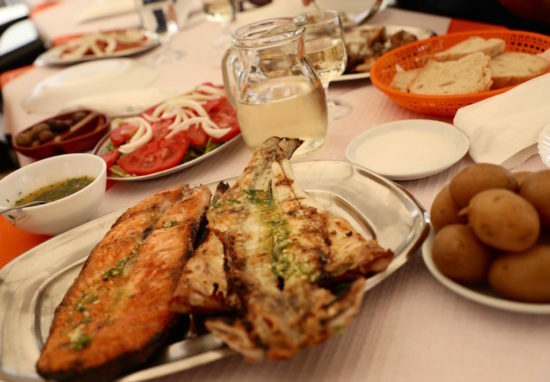 In addition to a Mediterranean culinary base with fish and crustaceans, lots of vegetables and juicy fruit, you will also find plenty of Moorish influences in the Algarve. Think of ingredients like citrus fruits, figs, almonds and locust beans. The first afternoon in the Algarve, we had lunch at Restaurant Dom Petisco in the most southerly point of Portugal. It is a delightful place to stay on a shaded terrace overlooking the Guadiana River, which borders Spain. With a cooling wind, it’s a lovely oasis around mid-May. What is on the menu? Vongole in a classic way, with garlic, olive oil, and lemon. In addition, a wine from the Algarve of the Arinto and Chardonnay grapes. The Chardonnay grape is usually not my favourite, but in combination with the Arinto grape, the wine is well balanced. 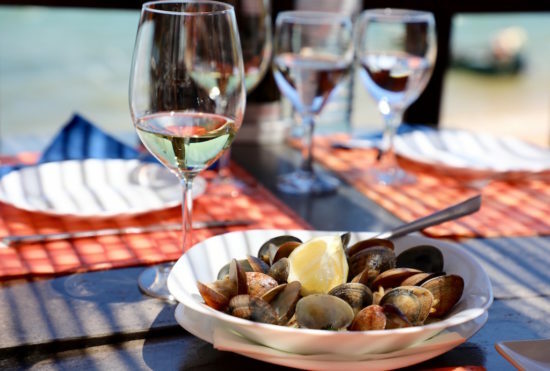 The somewhat round, full and even greasy Chardonnay goes well with the vongole and then with the table-filed dorado. The cheeks of the grilled fish, according to experts, is the best part. They are served separately here. 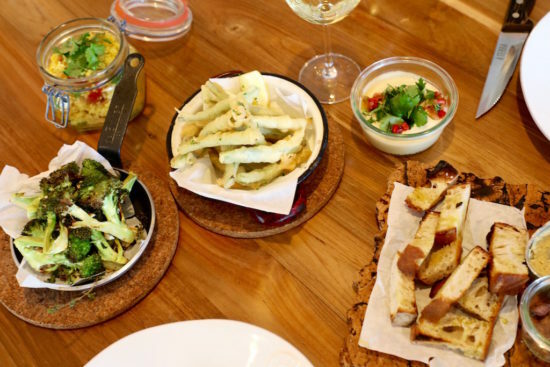 ‘Food to share’ is a proven concept you may have seen anywhere in the world, as in Restaurant A Terra. We started with a very crispy baked bread from the wood oven with mild hummus. Consecutively, we had the following on the table: grilled vegetables (grown biologically), curry with tofu, rice, couscous and quinoa salad. We had the same wine as in the afternoon. The Barranco lungo tasted excellent. ‘As much as possible, it is usually bought locally,’ said Gustavo, the General Manager of Praia Verde Boutique Hotel. Usually, I skip dessert, but the chocolate chip comb with red fruit is too appealing. 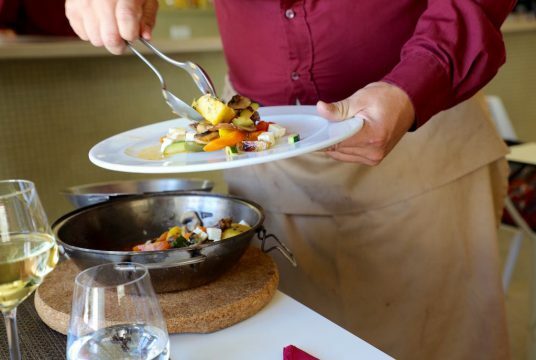 Who thinks that eating out in a hotel restaurant is not a good choice? I recommend you try it. Let yourself be amazed at A Terra! 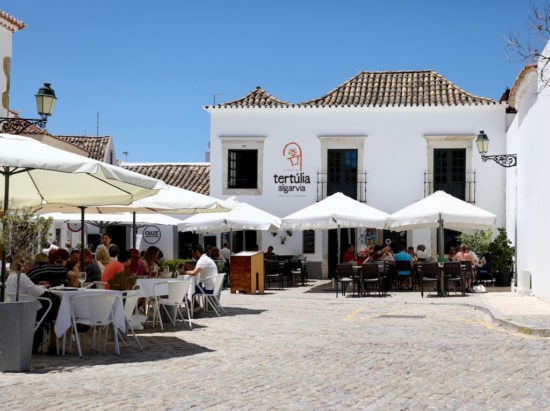 Tertúlia Algarvia in Vila Adentro – Faro’s historic center – was set up by a group of friends who wanted to start a project for the community to familiarize people with the gastronomy, history, and traditions of the region. If you book a cooking workshop, you will visit the market where you buy fresh food, you will prepare the food as a group and afterward, you will eat it naturally. At our table, there was a hot wok. In this mini ufo is a colourful vegetarian version of cataplana algarvia. This regional specialty is often served with seafood. Our veggie variant has steamed vegetables like carrot, mushrooms, pepper, and tomato with feta as savoury flavour. Lunch in this delicious weather is the sweetest in an open-air restaurant. You choose a fish under a thick pack of ice to grill. We chose dorade, salmon, and catfish. We ate the fish with a simple and tasteful tomato and onion salad, combined with olive oil and sea salt. We had white wine. There was also bica (an espresso) – a Portuguese almond liqueur – and a few ice cubes. On the last evening we shopped at the local supermarket. Picnic at your hotel is also nice. And we immediately bought local food for home, because edible souvenirs are favourite! There were sea salt, goat cheese, sardine paté, pure chocolate with flor de sal, Algarve wine, almond liqueur and Fonseca port, which is almost local. Well, at least also Portuguese. 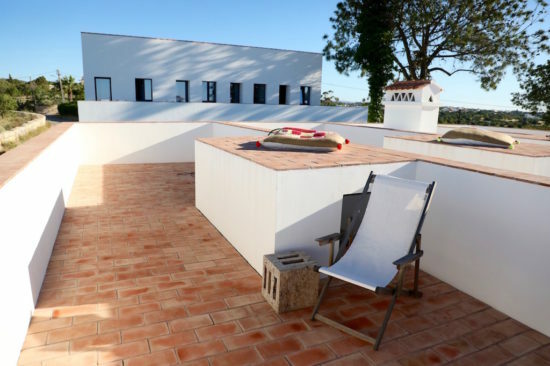 Where to stay in the Algarve? Loves to travel the world to share Pure! food spots with you: organic, local & fair trade, mostly veggie and delicious! 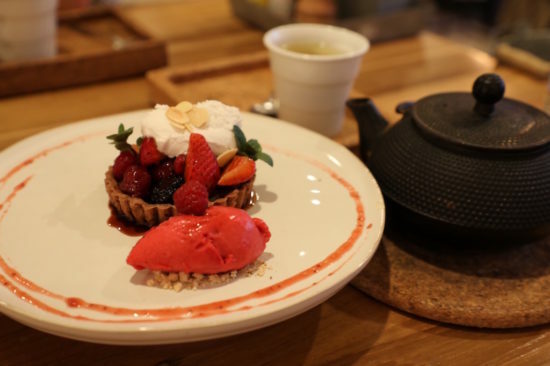 Restaurants, food markets, pure wellness and more tips. Where do you find the restaurant that serves pure, delicious food or the shop that sells organic products? And what markets do you need to explore for the local delicacies? At Pure! Food & Travel, it is our mission to show you where to enjoy pure food all around the world. We also help you contribute to a better world for people, animals and the environment.